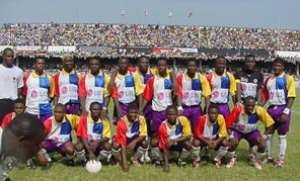 Kumasi, Jan 9, GNA - Accra Hearts of Oak Sporting Club won the maiden CAF Confederation Cup 9-8 after a marathon penalty shoot out in the final match against archrivals Kumasi Asante Kotoko on Sunday at the Kumasi sports stadium. Like the result of the first leg match in Accra a week ago, both teams settled for a 1-1 drawn game at the end of regulation time. Charles Taylor scored Kotoko's goal in the 51st minute, incidentally his first goal against his former club, Hearts of Oak since joining Kotoko, while Hearts equalised in the 80th minute through Adjah Tetteh. Dan Quaye, Emmanuel Osei Kuffuor, Francis Bossman, Acquah Harrison, Lawrence Adjei, Ablade Morgan, Adjah Tetteh and Michael Donkor scored for Hearts while skipper Amankwah Mireku missed his kick. For Kotoko, Issah Ahmed, Frank Osei, Yusif Chibsah, Michael Asante, Godfred Yeboah, Dan Yeboah and Michael Ofosu-Appiah scored from their kicks while Edmund Owusu-Ansah and skipper Joseph Hendricks missed their kicks. The result of the match was reminiscent of the 2002 debacle in an African Cup Winners Cup in Kumasi when WAC of Morocco lifted the trophy before the teeming supporters of Kotoko with a 2-2 goals aggregate even though the visitors lost 2-1 in Kumasi. Some of the supporters of Kotoko started leaving the stadium when referee Guirat Heichnen blew his whistle for the end the match and was asking players of both teams to get themselves ready for the penalty shoot out. Those who remained to watch the penalty kicks remained routed to their seats after Michael Donkor scored Hearts winning goal. When the match started it was Kotoko's Michael Osei who headed the ball over the bar in the 10th minute after he beat an off side trap to put his head to the ball that was floated from a free kick taken by Michael Ofosu-Appiah. This early move was followed in the 17th minute with Yusif Chibsah's tricky shot which went a shade of mark and was followed two minutes later by Ofosu-Appiah's curling free kick that sailed gently over the bar. Hearts gradually came into the game and in the 20th minute they earned their first corner kick which was wasted and again came close to taken the lead in the 23rd minute but Godfred Yeboah saved the situation by heading the ball away from Prince Tagoe. Veteran Emmanuel Osei Kuffuor was the first to attract the yellow card in the 29th minute when he fouled Stephen Oduro from a back tackle. Still probing for a goal, Kotoko earned their first corner kick in the 43rd minute but they could not utilise it. Back from recess, Charles Taylor who had been tightly marked by the Hearts defence shot Kotoko into the lead in the 51st minute with a terrific shot from Michael Osei's header to Ofosu-Appiah's cross. This goal signalled the wake up call to Hearts who put Kotoko under sustained pressure and earned a corner kick in the 55th minute but Francis Bossman shot wide from the resultant kick. Kotoko came into the picture again in the 58th minute and Ofosu-Appiah hit the cross bar from about 40 metres with a terrific shot with Charles Taylor's header to the rebound flying over the bar. Kotoko at this stage sent in Dan Yeboah for Michael Osei in the 66th minute and a minute later, Hearts goalkeeper Sannie Mohammed was booked for deliberately stepping on Yusif Chibsah. Hearts also pulled out Bernard Don-Bortey for Ablade Morgan and Louis Agyemang for Lawrence Adjei in the 71st minute while Frank Osei took over from Nana Arhin Duah with Charles Taylor coming out for Edmund Owusu-Ansah in the 73rd and 78th minutes respectively for Kotoko. Hearts kept on probing for the equaliser which came in the 80th minute through Adjah Tetteh who connected home skipper Amankwah Mireku's corner kick to throw the game wide open.